I couldn’t believe I found this picture of my mom! I remember while growing up she told me she was hurt badly on a swing when she was a young girl. My heart ached as I told her to give it more time. At that moment, I had tremendous admiration for my mother and significant pain for doubting that she would keep trying. My mother was not about to let the ravages of old age prevent her from giving up hope! Miriam called me – I could tell by her voice that she was trying to contain her anxiety. The phone was given to my mother. I explained to her how she could actually harm the healing process; she must accept that walking would come later. I told my mom not to be angry with Miriam. When our call was over, I could tell my mother was crying. After that I began to make calls. I spoke with a nurse practitioner and it was explained to me that no weight was allowed on my mom’s unrepaired hip. My mother would not have any physical therapy for several months. It sounded discouraging to me. Then I spoke with a nursing supervisor and I asked if my mother could stand up to use a toilet. My mother might not be allowed to walk, but she could stand on her “good leg” to use a toilet. The supervisor told me a commode that was the correct height for my mother would need to be ordered. It would take a day or two for it to arrive. When my mother fell and broke her hip, I was told that without surgery she might die over the weekend. Now my mother had no pain and wanted to walk! I began to realize that my mother’s hospice services were not as helpful as I thought they would be. All medical decisions had to go through the hospice department. I still did not hear back after a week about obtaining a “prescription” so my mother could have a seatbelt. Otherwise, she was close to sliding out of her enormous wheelchair. I decided to let that go. For several weeks, I had left messages and spoken with numerous medical personnel about obtaining an antidepressant medication for my mother. My father had been against it for such a long time, but I decided my mom’s fall was actually a result of her depression and frustration. I cannot write anymore about this without feeling like I am in a tragic, comedy show! It did not seem possible that anyone could be more depressed than my mother over her predicament! 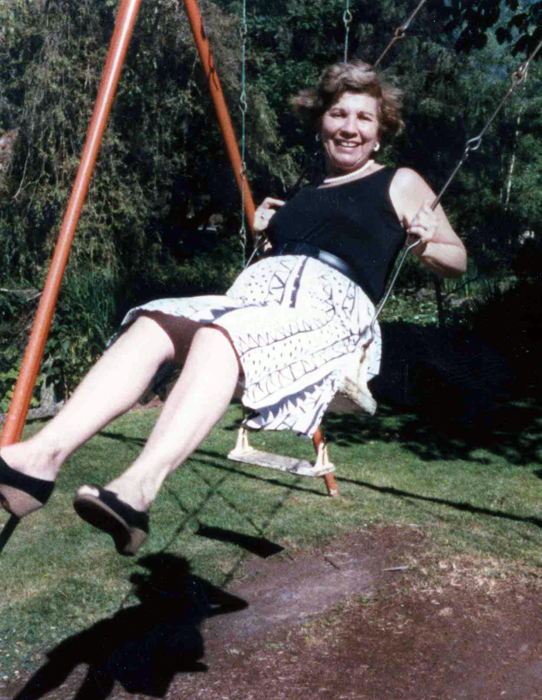 My mother had always been such an optimistic person, and her unhappiness radiated from her much of the time. I couldn’t believe I had to explain it! I articulated my mother’s situation to this hospice nurse. I was absolutely astounded to hear this! How quickly my mom would be prescribed Morphine and Vicodin without a second thought. My mom’s “mental anguish” however, was far worse for her than any physical pain. My mother-in-law gave up on her life due to her mental anguish. I saw first-hand the result of deep depression. This nurse told me to think about discontinuing Hospice. I felt embarrassed for all the paperwork I had generated. It was such a waste of time, and what if I ended up needing it in the near future? After being told to “think about it for a few days,” I did just that. I plan to have it discontinued. This is such a great memory. My mom loved playing blackjack with me. 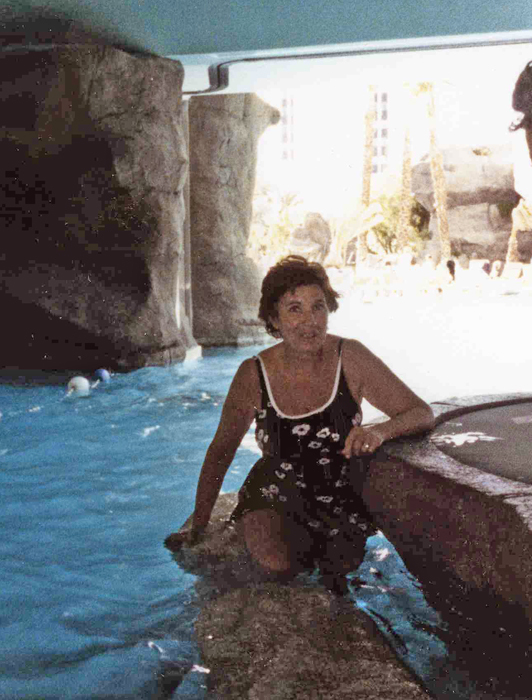 This was taken while we were on vacation together in Vegas at a “swim up” blackjack table. I had a list from Miriam of things I could buy for my mom. I was at Sears buying socks when Miriam called. She said that the special commode had arrived and my mom had used it. We were both crying and laughing – for my mom to use a toilet was a huge step for her dignity! HUGE! I shook my head and felt much more resolute about discontinuing hospice. I needed to find an alternative thought to replace what I had just blurted out to Connie. I came up with a replacement first for the word “doubt.” Far better than saying “doubt” was saying “uncertainty.” Of course it meant the same thing, but Connie and I agreed it was a “lighter” approach. The “killing me” part slipped out before I knew it. It was definitely a painful admission. I talked about it with Connie, and explained how human I was. Despite feeling “courageous” and inspirational, it was still very difficult to counter so many people in the medical field. However, nothing was actually “killing me” badly enough. I can honestly say, that I have been dancing through my life, lately. I’ve had no “stomach issues,” which usually are a manifestation of stress in my life. That’s amazing because I still have teenagers, too! It had been two days since I had visited. I had stopped by at night, but I didn’t count that because my mother was asleep. I had dropped off all the new items that I had bought for her. I was ready to leave and Miriam gave me a warm hug. She told me how my mom once again used the commode and had no pain. It was still a huge production to wheel her special wheelchair toward the bathroom. The size of the wheelchair left little area to maneuver. Tremendous patience and energy was needed to pull this off. I had no doubt that Miriam was up to the challenge. 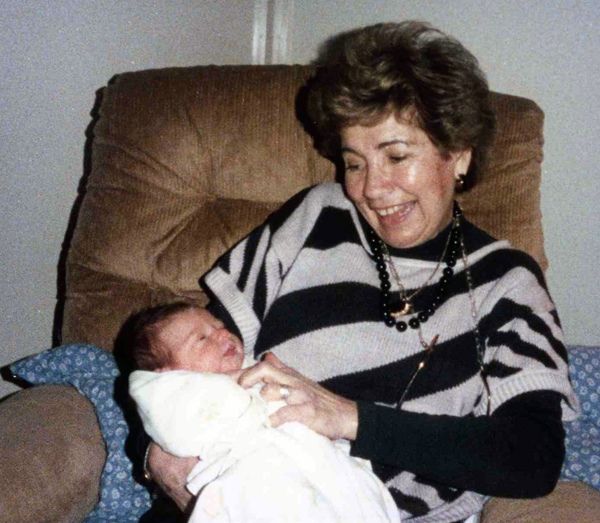 This picture is of my mom and her first grandchild, Marisa. © Judy Unger and http://www.myjourneysinsight.com 2011. Unauthorized use and/or duplication of this material without express and written permission from this blog’s author and/or owner is strictly prohibited. Excerpts and links may be used, provided that full and clear credit is given to Judy Unger with appropriate and specific direction to the original content. This entry was posted in Hip fracture-no surgery and tagged "sandwich generation", Aging Parents, broken hip, Caregiving, Daily Life, hip fracture without surgery, Hypnotherapy, mother. Bookmark the permalink.